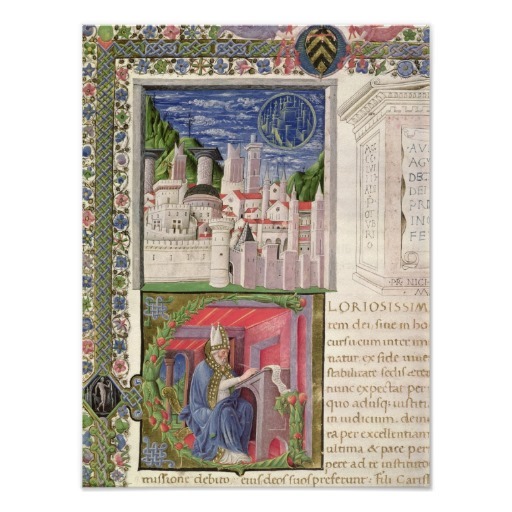 The book explores the history of Justiniana Prima, a city built by Emperor Justinian I (527-565) in his birthplace near Niš in present-day Serbia. Previous studies focused on determining the city’s location, underestimating the significance of analyzing written sources for the reconstruction of this city’s genesis and importance. Using information from Emperor Justinian’s Novels XI and CXXXI, as well as Book IV of Procopius of Caesarea’s De aedificiis, Stanislaw Turlej endeavors to show that Justiniana Prima’s historic significance resulted from granting its Church the status of an archbishopric with its own province in 535, which was independent of Rome. Justinian wanted to introduce profound changes to the ecclesiastical organization based on state law. As sole emperor, Julian restored the worship of the traditional gods. He opened pagan temples again, reintroduced animal sacrifices, and propagated paganism through both the spoken and the written word. In his treatise Against the Galilaeans he sharply criticised the religion of the followers of Jesus whom he disparagingly called ‘Galilaeans’. He put his words into action, and issued laws which were displeasing to Christians–the most notorious being his School Edict. This provoked the anger of the Christians, who reacted fiercely, and accused Julian of being a persecutor like his predecessors Nero, Decius, and Diocletian. Violent conflicts between pagans and Christians made themselves felt all over the empire. It is disputed whether or not Julian himself was behind such outbursts. Accusations against the Apostate continued to be uttered even after the emperor’s early death. In this book, the feasibility of such charges is examined. The profound economic and strategic significance of the province of “Africa” made the Maghreb highly contested in the Byzantine period—by the Roman (Byzantine) empire, Berber kingdoms, and eventually also Muslim Arabs—as each group sought to gain, control, and exploit the region to its own advantage. Scholars have typically taken the failure of the Byzantine endeavor in Africa as a foregone conclusion. North Africa under Byzantium and Early Islam reassesses this pessimistic vision both by examining those elements of Romano-African identity that provided continuity in a period of remarkable transition, and by seeking to understand the transformations in African society in the context of the larger post-Roman Mediterranean. Chapters in this book address topics including the legacy of Vandal rule in Africa, historiography and literature, art and architectural history, the archaeology of cities and their rural hinterlands, the economy, the family, theology, the cult of saints, Berbers, and the Islamic conquest, in an effort to consider the ways in which the imperial legacy was re-interpreted, re-imagined, and put to new uses in Byzantine and early Islamic Africa. Religions of the Constantinian Empire provides a synoptic review of Constantine’s relation to all the cultic and theological traditions of the Empire during the period from his seizure of power in the west in 306 CE to the end of his reign as autocrat of both east and west in 337 CE. Divided into three parts, the first considers the efforts of Christians to construct their own philosophy, and their own patterns of the philosophic life, in opposition to Platonism. The second assembles evidence of survival, variation or decay in religious practices which were never compulsory under Roman law. The “religious plurality” of the second section includes those cults which are represented as demonic burlesques of the sacraments by Firmicus Maternus. The third reviews the changes, both within the church and in the public sphere, which were undeniably prompted by the accession of a Christian monarch. In this section on “Christian polyphony,” Mark Edwards expertly moves on from this deliberate petrifaction of Judaism to the profound shift in relations between the church and the civic cult that followed the Emperor’s choice of a new divine protector. The material in the first section will be most familiar to the historian of philosophy, that of the second to the historian of religion, and that of the third to the theologian. All three sections make reference to such factors as the persecution under Diocletian, the so-called “edict of Milan,”the subsequent legislation of Constantine, and the summoning of the council of Nicaea. Edwards does not maintain, however, that the religious and philosophical innovations of this period were mere by-products of political revolution; indeed, he often highlights that Christianity was more revolutionary in its expectations than any sovereign could afford to be in his acts.This authoritative study provides a comprehensive reference work for those studying the ecclesiastical and theological developments and controversies of the fourth century. It is by way of this concept that Olof Heilo presents the decline of the Eastern Roman Empire as a key to understanding the rise of Islam; two historical processes often perceived as distinct from one another. Eastern Rome and the Rise of Islam highlights significant convergences between Early Islam and the Late Ancient world. It suggests that Islam’s rise is a feature of a common process during which tensions between imperial ambitions and apocalyptic beliefs in Europe and the Middle East cut straight across today’s theological and political definitions. The conquests of Islam, the emergence of the caliphate, and the transformation of the Roman and Christian world are approached from both prophetic anticipations in the Ancient and Late Ancient world, and from the Medieval and Modern receptions of history. In the shadow of their narratives it becomes possible to trace the outline of a shared history of Christianity and Islam. The “Dark Ages” thus emerge not merely as a tale of sound and fury, but as an era of openness, diversity and unexpected possibilities. Be taught, ye abandoned creatures, and ascertain the causes of things; what we are, and for what end we are born; what is the law of our success in life; and by what art we may turn the goal without making shipwreck; what limit we should put to our wealth, what we may lawfully desire, and what uses filthy lucre serves; how much we should bestow upon our country and our family; learn, in short, what God meant you to be, and what place He has ordered you to fill. Let them name to us the places where such instructions were wont to be communicated from the gods, and where the people who worshiped them were accustomed to resort to hear them, as we can point to our churches built for this purpose in every land where the Christian religion is received. One of the interesting features of the this chapter and, indeed, the entire book is the extent to which Augustine believes it to be religion’s role to inculcate virtue–including civic virtue–in its adherents. The morality that Augustine is discussing is not a private or interior morality, at least not solely. In the previous chapter, he castigates the Romans for bestowing their finest citizens with the honor of a statue of “that demon Cybele.” Robert Dodaro writes: “[E]ven Rome’s best citizens are deceived by Cybele, the ‘Mother of the Gods. 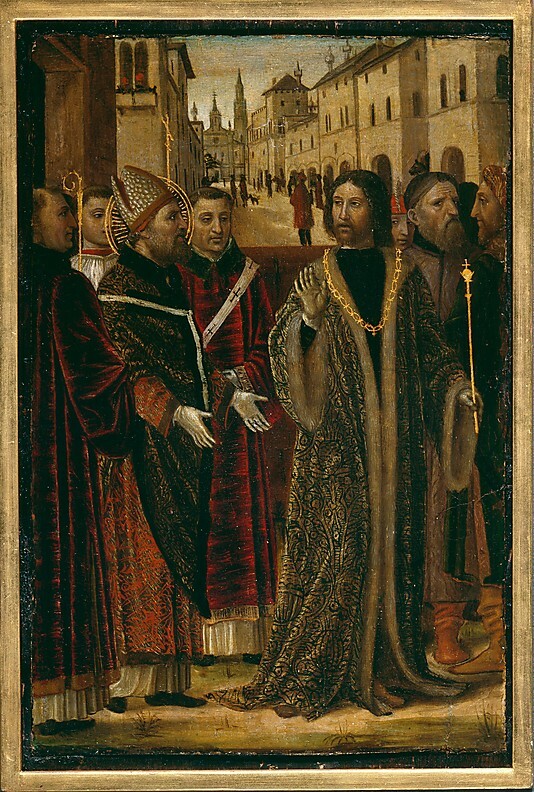 '” Dodaro, Christ and the Just Society in the Thought of Augustine 45. And here, Augustine specifically mentions the morality not of individuals, or even of families, but of “cities and nations.” The context in which he condemns Roman vice is not personal, but public–the feast of Fugalia, which so far as I can tell is a civic feast celebrating the expulsion of the Roman kings. And the fragment he quotes from the stoic Roman satirist Persius concerns both private and public virtue (“how much we should bestow upon our country and our family”). Augustine clearly believes that it is an important function of religion to inculcate civic or public virtue and honor. Religion is not a privatized or purely personal phenomenon, and any religion worth its salt must do more than “whisper” “secret incitements to virtue” “to the elite” (notice that by highlighting the “elite,” Augustine is emphasizing the importance of religion’s influence on the powerful, including the politically powerful). It must inform their private and public lives. It must provide a public forum–a place of assembly–for the discussion of virtue to occur (not just a private “whispering”). And it must “vehemently lash” public men. Christianity, Augustine believes, performs these functions, while the Roman gods failed to do so. For most church-and-state types, the word “Constantine” is likely to evoke the so-called “Constantinian Compromise,” in which the Christian Church in the late Roman Empire purportedly accepted imperial protection in exchange for subordination. When he wasn’t convening church councils, though, Constantine had other affairs of state to attend to, including the workings of the Roman legal system. 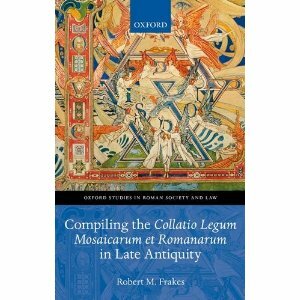 John Noël Dillon (University of Exeter) has a new study of Constantine’s contributions to Roman law, The Justice of Constantine: Law, Communication, and Control (University of Michigan Press 2012). The publisher’s description follows.